An Alexandria, Virginia, man held onto a Powerball ticket for more than a week before discovering it was worth a cool $1 million. Arthur Martin, a building engineer, said he never expected the ticket, which he bought ahead of Aug. 23's $700 million Powerball jackpot drawing, to be a winner. "I never checked the numbers," he said, according to a release Friday from the Virginia Lottery. Martin bought his winning ticket at Parkway Express on Loisdale Road in Lorton. His ticket matched the first five numbers -- 6, 7, 16, 23 and 26 -- but missed the Powerball number, making it worth $1 million. But it took him more than a week to realize. 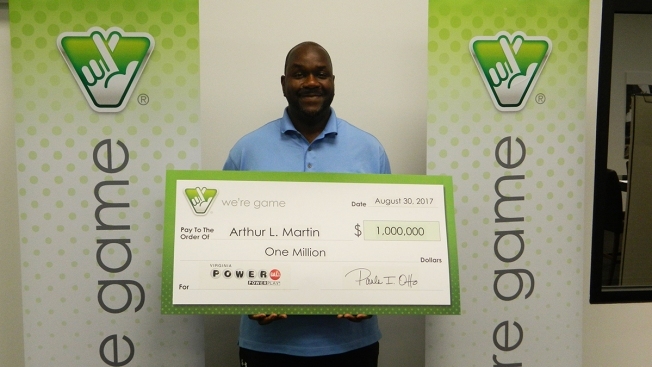 According to the release, Martin said he doesn't buy lottery tickets often, but when he does, he usually waits a week or two before scanning the tickets at his local store to see if he won anything. "It was surreal," he said, according to the release. "I thought I was just donating to the Virginia Lottery education fund. Took four days to get over the initial shock." Martin said he plans to pay off debts and enjoy a nice holiday season with his family.